If you are looking for a hair color trend that will be the talk of the town, you should consider acquiring the blue-black hair dye. It is notably a good idea if you have black hair and you want to incorporate a blue dye shade that can flatter your skin. There are several combinations that you may use to fuse a blue color hair dye to your black hair to compliment your skin. If you are working with dark skin, you can use a lighter shade of blue-black color whereas a light and pale-skin tone works well with darker colors. A dark blue-black hair dye can give you a sultry look with an amazing cool edge. The hair color is subtle, and you can wear it for any occasion. It can transform when you place it under different lighting, and the deep dark color gives the hair a fantastic shine and depth. Before you color your hair, it is advisable to treat it fast so that the result may be super smooth. But how do you find the best blue-black hair dye today? The market has a wide array of different blue-black hair dyes. The shades and level of permanence are also different between all these products. While taking into consideration all of the crucial factors, here are the three best blue-black hair dyes in the market today. The Top 3 Blue Black Hair Dyes in The Market Today. The L’Oréal Paris Hair Color is a gold standard hair dye that delivers a luminous hair with an impeccable shine. The hair color contains a unique fade-defying color system that is paired together with the supreme conditioner qualities of the dye and a shine serum maintaining the vibrancy of the color and making the hair silky and shiny. 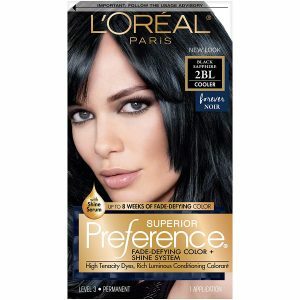 L’Oréal Paris can deliver permanent, semi-permanent, temporary hair dye or a dye that covers the roots of the hair. The permanent L’Oréal Paris hair color comes with various formulation and styles that includes grey coverage, stylish feria, fade-defying superior preference all meant to deliver a long-lasting glow. The Garnier Nutrisse Nourishing Color Creme Nourishing Color Crème is the perfect solution for anyone that wants to look great but are on a budget. It is the best home product that comes with a salon quality and aids in keeping hair look amazing and healthy. 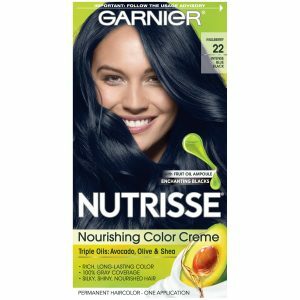 The Garnier Nutrisse Nourishing Color Creme is well known for lasting for long periods while also giving the user a radiant look. It is handy in covering the grey hairs on the head. The dye comes with natural oils that nourish the hair and keep it silky and smooth. During application, it covers the whole hair from the root to the tip. You as well get a separate packaging of grape seed oil that helps to nourish the hair from the period when you begin the treatment. The dye is simplistic to use and comes with a three-step application process for beginners and home users. It is best for use on people with long and thick hair. 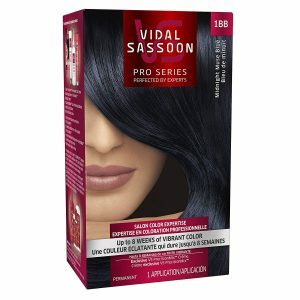 The Vidal Sassoon London Luxe contains a blend of very complex pigments that can yield professional results. Unlike how many people think shampoo is the main reason the hair color fades, the primary cause of hair color loss is water and the minerals in the water. The Vidal Sassoon London Luxe features a hydra block technology that helps to prevent water from fading the vibrant color of your hair. The dye is long-lasting as it can deliver up to 8 weeks of vibrant color coverage. However, it does not perform well for heads that have more than 50 percent of grey hair. It has a simple application procedure, making it suitable for use amateur hair dye users. When selecting a blue-black dye for the hair, you do not have to go for the most expensive product on the market. You should instead consider the strength that a particular hair color delivers and select one that has the best solution for your hair condition. Not all the blue-black hair dyes are permanent. Always read through the packaging of the hair color to identify its strength as it will then guide you on the performance of the hair color over time. Check through reviews too to get a clear picture of the experience other users have had with the product. You may be surprised to find the best blue-black hair dye with a low market cost but very high quality. By using any of the products above, you are confident at improving your overall image and standing out in a crowd.